I had a breakfast the other day with my friend ‘Pastor Benson’ it was great to catch up with him. He arrived in Kingswood with the instructions from his Church leader to “plant a Church in Bristol”, and that’s how I got to know him and become friends. He tried planting in the conference room of the Soundwell Swimming Baths, before moving into the city centre into the Holiday Inn as a venue for their Church. He now has a small fellowship meeting regularly there, interestingly I asked how his Church started and he had on e word “grit”. Each Saturday they went out onto the streets and invited people to come (anyone doing much Street work knows what a hard and thankless task it can be! ), each Sunday there were there, set up, with tea and coffee waiting for people, as they prayed, worshipped and sought God. It took 7 or 8 weeks before anyone other than his family to come and join them, yet they kept on going, they didn’t quit, and the Church was born. He said to me on Saturday “it doesn’t say well done and gifted servant, or well done successful servant, but well done good and faithful servant” we just had to be faithful. My mind wandered back to my Greek lessons at College (not exactly my finest hour!) and remembered a phrase (actually normally used of being filled with the Holy Spirit) which is “go on be being filled”, but wondered if “go on be being faithful” perhaps might have the same idea, faithfulness isn’t a one off, but something we are called to be in a continuous cycle of repetition, remaining actively faithful. Yet as I thought about this, it is amazing how quickly Christians scarper from the battle-field, they may all be noisy in the barracks before the battle, and maybe be around for the first charge, but faithfully having the grit and determination to ‘stand firm’ or ‘stand fast’ keeping going with what God has called us to do. Holding the line in obedience not wandering off in distracting vanity projects, not fleeing the battle front-line for a safer-option. Let’s be people of grit, of determination and perseverance. Scripture is full of heroes that kept on going, that remained faithful, gritty characters that persevered, Noah building the Ark, Moses leading the people through the desert, Esther in prayer, Ruth in her commitment to her mother-in-law Naomi, Daniel in righteous living, Nehemiah in re-building the wall and Paul in the proclamation of the Gospel. Yet our greatest example of grit and deterination is Jesus “who for the joy that was before him endured the cross and scorned its shame”. Jesus did quit on his Fathers Mission even when his sweat fell like drops of blood, even when it cost him everything he had including his life. Jesus remained faithful unto death “even death on the cross”. I believe the “secret” to transformation in mission is not more courses, or new programmes and ideas but rather greater grit, more steadfastness, keeping going and pressing in to see the harvest. Bill Wilson of metro-ministries the worlds largest Sunday School in New York said “Christians so often quit before the break through”. So, a challenge for us all is to not just start new things but have the grit and see them through and come to fruit. Patient endurance is tough, but often the key to fruitfulness. Yesterday I met up with my old prayer triplet from college, most weeks we would meet up, and chat and pray for each other and all that’s going on in our lives, and since college we have kept on meeting up (so I guess we’re on our 13th year!). It is good to share with other people who are running a similar race to you, to remind you that the gospel and the Kingdom is best served lived out and proclaimed faithfully day in and day out alongside real people who don’t yet know Jesus. we need friends that will encourage and inspire us. we need people that help us stay focused on Jesus, we need people to help lift us up when we fall, and support us when our confidence gets knocked (and sometimes our confidence gets knocked in him too). we need others to keep us on track. I have been working in various Churches and Christian organisations now for 20 years, and as I look back God has placed some truly wonderful people around me at various stages of my journey. we need one another. The Christian life can be a lonely one and we need those people to spur us on, to encourage us to keep going, to run the extra mile, to reach for the prize, to not quit but go on for the gold. we need friends to pick us up too when we fall down, to support us when it is tough. we also need friends to be honest with us, sometimes (and this needs to be the right people in the right context) be brutally honest. we need to at times “confess your sins to one another so you maybe healed”, and I know from experience that I find being vulnerable difficult and the acute shame when I’ve messed up is wonderfully relieved when shared with a brother in Christ. It takes courage to be vulnerable, I remember in Poole I was in a lads prayer group and we’d been meeting for a while, and then one of the guys admitted that he’d been struggling with lustful thoughts, and all of us admitted we did too. Yet none of us had been brave enough to say this, and we were in an accountability group. Later when I was at college I discovered one of my theological heroes, Dietrich Bonhoffer, who talked about two fellowships “the fellowship of the righteous” and the “fellowship of sinners”, the first the fellowship of the righteous where we all pretend to be fine, sorted and stiff upper lip. whereas the fellowship of the sinners, is being honest about the struggles and the strains of our walk with Jesus. It is so easy to let one another off the hook and keep everything nice and superficially pleasant, but then we don’t grow in our faith, we get stuck and stagnate, and don’t become all that Christ wants us to be. It feels scary and risky admitting the things we struggle with, and I can’t guarantee that every Christian grouping will respond well or appropriately when we share, because when we share it challenges them too, and as people we know that going deeper is good for us, but being shallow is less costly and painful. Yet God rejoices when Christian communities go deeper. If Churches are not changing lives than why are we opening our doors? we need to be people that have one another’s backs, and hold one another in prayer “because your enemy, the devil, wanders around like a roaring lion seeking someone to devour”. It is a tragedy that in our individualistic, consumerist and complacent culture that sadly has crept into the Church that we want people to have our backs and pray for us, but are we doing that for someone else. A great question is “have you got a mentor?” but it should be followed by the question “and who are you mentoring”. If I ever get to be on an interview panel for a Christian job one of the questions I’d ask is who are you accountable too, how regularly do you see them, and how ruthlessly honest are you? we are called to bring the best out in one another, but that does mean challenge and sometimes conflict. I love the verse “iron sharpens iron as one person sharpens another” but I am reminded that when iron sharpens iron there are often sparks that fly off and it can be perilous. If someone asks you to pray for them as they go into a tricky situation for them, not only pray for them, but check up and see how they got on, and if they have asked to be accountable then be full of love and grace but seek to bring light and truth into situations. The problem is all this sounds good in theory, but to put it in place isn’t easy, and then to set the level that actually gets a real and authentic honesty is hard, and also trust takes time to be built up too. Yet this is what I feel Church ought to look like. I remember talking about my time working in rehab and seeing how people were so honest with each other, how they were ruthlessly blunt too with their questions and also wonderfully loving and gracious -and saw peoples lives changed and transformed. Too often I think we think of discipleship as being able to regurgitate Bible verses (and it is good to know scripture) but actually what we want and long to see in our own lives and the lives of our Church family is real, lasting, deep change at the core of our being, that we become healed, restored and shaped into all that God wants us to be. Sounded more spiritual has some benefit but it cannot be at the cost of the true business of the Church which is Kingdom transformation. we need one another, and they need us. The Africans have a proverb “it takes a village to raise a child”, and I think that is true spiritually too, it takes a village to raise a follower of Christ, we need one another to be all that Christ wants us to be. So the question we need to ask ourselves is how can we be real, honest and vulnerable? Are we brave and courageous to seek the help and support of others? People say “I don’t need to go to Church to be a Christian” firstly we don’t go too Church we are the Church, but the truth is that people need us, and we need them, and God has placed other people around us as a gift, a wonderful resource to bless us, and us them. So, lets gather our running mates, and keep on running together, discovering that running in a team helps make us faster and travel further and more quickly than we could do on our own. “let us not forsake meeting together, but let us spur one another on towards love and good deeds, ever more as we see that day approaching”. “There is nothing remotely sissy about the women’s auxiliary balloon corps”. A quote from Blackadder from Captain Darling, both trying to work out ways of avoiding death in the first world war by trying to escape the trenches, yet neither of the two men wants to admit that actually they are afraid of fighting and dying. Captain Darling, manages to get a safe job behind a desk, and Blackadder tries (and fails) to be posted elsewhere. This picture reminds me of uncomfortable (and maybe uncharitable) thoughts and conversations I have had with Christians about mission and evangelism. The truth seems to be they’d rather be doing something nice and pleasantly Christian rather than the costly and sacrificial following of Jesus. Interestingly, we were doing an outreach on Easter Saturday, and the Church was full of people doing flowers, but only one person came out onto the streets to do outreach with us. I remember once we were desperately short of people to help with out teenagers and one person emailed to say she couldn’t do it because she was the only singer who could sing soprano (or something like that) in the choir. The problem is this is it is majoring on the minor. Prioritising the trivial over the transformative. Our will being done, not Christ’s will be done. Discipleship cannot be conditional discipleship, following Jesus only when we happen to be going in the same direction. Decaf Christianity with extra milk foam. when I was at college there was a cartoon that said “God I will go anywhere you call me too” and underneath it said “provided it is in Surrey”. It made me think, is the problem with discipleship in the west that it is discipleship on our terms? I think all of us find it easier to serve God when it is fun and rewarding, it is harder when it is seemingly making little progress. Rather than being a backseat driver I fear when the call looks costly, or it is hard-work and a slog, we wrench the steering wheel out of God’s hand or pull up the handbrake and rush for the nearest cushy and consumerist gathering and end up seeking out roles of maximum kudos for minimum cost, the safest option. The truth is following Jesus is either about obedience and faithfulness or disobedience and sin, the problem is that too often we try and give sin and disobedience a sugar coating of religiosity and respectability. Blackadder sought glory but not the danger, wants recognition without risk, medals without cost, honour without achievement, and reward without sacrifice. Yet Christianity has never been safe. Jesus talks of picking up our cross and following him. Following Christ will cost us everything we have, it is an “everything or nothing choice”. As I thought about this blog, I wondered about getting David Beckham to make the squash at football matches. It is a job he could do, but it is substantially short of what he is capable of, and leaves the wider body deprived and should short. Too many are full of potential that they leave deliberately untapped, because -as a proverb says- “many opportunities are missed because they come in overalls and look like work”. Lets not give God the fag butts of our time, energy, gifting and resources rather than our first fruits. So, let’s not be like Captains Darling and Blackader trying to slope off the battle-field, but instead bravely give all that we have, our best efforts and richest resources in the service of King Jesus. Jesus for President, was the title of a book by one of my heroes Shane Claiborne, the title made me think, firstly I thought Jesus never wanted to be president, he was offered all the Kingdoms of the world when he was tempted by the devil, and yet he turned it down. Instead Jesus was a nomadic preacher, with nowhere to lay his head, former child refugee who advocated loving enemies, rather than clicking his fingers in the board-room he took a towel and washed his disciples feet, including the one, Judas, who betrayed him. Yet Jesus is the one I want to follow, his Kingdom may appear upside down to most of the world but to me I think it is the right way up, and his Kingdom is what I want to devote my life to building. The Lord’s Prayer seeks for Gods Kingdom to come “on earth as it is in heaven” so clearly something of the rule and reign of God can be seen today in real lives and communities, not as some weird theocratic rule, but in hearts and minds transformed by God and living out their faith in radical Kingdom ‘salt and light’ living. As I was thinking was does a Christian world view look like, I am often confronted by the phrase ‘Christian Values’ which is often condensed to anti-abortion and anti-gay-marriage and whose rhetoric often sounds pretty un-Christ-like –God hates fags? No, of course he doesn’t, he loves each and every person he has made. and longs for all peoples to come into relationship with him. More over much of the American Christian Right seems very pro guns, anti health care for the poor and pro death penalty and I struggle how we can link these heinous ideas with the Jesus I find in scripture. Yet surely If we are called to have Christian values, if we really believe Jesus meant it when he called us to “love our neighbours as ourselves” then we are called to care about the welfare of the planet, foreign aid, education, justice, health care, civil liberties, community cohesion and ethical investment in economic policy. A Biblical world view is about bringing people together rather than building walls between each other… The Old Testament repeatedly tells Gods people not to I’ll treat the alien who resides in their country because they themselves were slaves in Egypt. A Biblical world view is one that is outward looking and not inward looking, “I am my brothers keeper”, inward looking ideals end in implosion. A Biblical world view realises that “the love of money is the root of all evil” and realises that financial prosperity and true happiness are not bedfellows. A Biblical world view sees us from every nation as Gods children and extreme nationalism seems to me like a idol or fake God than needs to bow the knee to Christ, an illusion that hoodwinks many people. A Biblical world view sees enemies being loved, the other cheek turned and the myth of redemptive violence seen for the lie that it is… As Ghandi said “if we take an eye for an eye then the world we be blind”. When we think of Christ entering into the city he came on a donkey like the ones we see at Weston, not on a war horse or sitting on an amounted vehicle or tank, this Prince is called the Prince of Peace, and at fulfilment of his Kingdom will see swords turned in ploughs and people practicing war no more. A Biblical world view effects how we see one another who made in the image of God, can we imagine Jesus calling a woman –or anyone for that matter- a “fat pig”? In fact, as Christians we are called to fight for human dignity “to bless not curse”, we need to see the rest of the world as precious to God, whether they be a Mexican refugee, a community leader in Iraq or someone who has a different opinion to you. When I think of Jesus for President, I think the reason why I follow him is I can trust him, “let your yes be yes and your no be no”, when Jesus speaks we know it is the word of truth. Sadly in the American election the major parties seemed less interested in their candidates character talking more of the competence or rely on their charisma, however “competence and charisma without character often results in Catastrophe”. In a “Dog Eat Dog” world with people scrambling to be top dog we see Christ saying the last will be first. My prayer for whoever is president is that they may “Do Justice, Love Mercy and Walk Humbly before their God”… Knowing that with great power also comes great responsibility, the call to steward what you have been entrusted with well, knowing that are all answerable and must now the knee before Christ. Leadership is costly and sacrificial… Jesus said that he had not come “to be served but to serve and to give his life as a ransom for many”. This leader isn’t hidden away in a bunker with other soldiers fighting on his behalf, this King, this servant King, gave his life that we may live. This Servant King I will follow, and his upside-down Kingdom I will devote my life to seek and advance. A Heap of Stones or the Presence of God. I was in a queue at New Wine (a Christian Festival) and some fella in front of me, evidently a clergy person, was saying how they wanted to find up at a successful New Wine Church. As I thought about I wanted to punch him! Why is it the big and successful Churches especially in nice leafy suburbs seen to be sort after by clergy, yet those churches which need renewing, which are struggling and in trouble no one wants to come to. Just as in the world of teaching it’s the toughest schools which actually need the best teachers, yet everyone wants to go where it is successful. Yet I was thinking that actually this is asking God for a bit of an easy life, a comfortable cross to carry, a cushy call. When I was 20/21 I worked for two Churches in the North of England, one no one has ever heard of but saw God do amazing and wonderful things, the other is famous and much much larger and I didn’t see God doing very much at all. A Church living in it (glorious) past where God did wonderful things, but the past is just that past, gone. I vowed then that trying to revive smug carcasses, relics of the past, church morphing into a museum, was not something I felt called to but seeking where God was at work, or wanting to break in was where I felt drawn to. Sometimes we get sedduced by a name of a successful church, leader, ministry or movement and what they have done, but again the question remains not what has happened but what is happening. Sadly things that have mightily been used by God need to keep in step with him, the problem is we keep wanting to stop and to settle, where the spirit of God keeps pushing forward in waves, are we keeping up, or have we stopped, or stalled on our journey. To often we want to go where God has been, rather than where God is going, what God had done rather than what God is doing, sat looking at his footprints rather than chasing his shadow. We can’t live in the past, caught in history, rather that step into the future that God is beckoning us into. Often we share stories of conversation of what God has done in our lives that want he’s actually doing… Sometimes the stories we tell are getting a bit old, our best history rather that what God is doing with us now, today, and where is God leading us on to the future. So to close, let’s make sure our walk with God, our ministries, where we serve isn’t just resting sat back on its history but pushing forward chasing after where God is leading. Tommy Tenny used the phrase “God chasers” and I like the image of this, running after Christ and wanting to keep in step with his spirit, not stopping, not settling, not coming comfortable and complacent, stuck in a rut, lagging behind where God is leading us, sitting out for a season or doing our own thing. “If anyone builds on this foundation using gold, silver, costly stones, wood, hay or straw, 13 their work will be shown for what it is, because the Day will bring it to light. It will be revealed with fire, and the fire will test the quality of each person’s work. 14 If what has been built survives, the builder will receive a reward. 15 If it is burned up, the builder will suffer loss but yet will be saved—even though only as one escaping through the flames”. -Okay, let’s start with a bit of basic theology, we are saved by grace through faith. Yet we are saved the Bible says FOR good works not by them. So sometimes we forget that we are called to be different, to live out our faith, to build with Gold, silver and costly stones, to see God’s Kingdom advance on our frontlines, where God has placed us. As the film Gladiator says “what we do in life echoes in eternity”… I love John Wimber and he once said: “My plan is to run the race and take as many people with me as I possibly can”. He lived a life honouring Christ, and many millions of people found faith, our had their exisiting faith renewed and re-inspired by the spirit of God through the Vineyard movement which Wimber founded (not to mention the legacies of St.Andrew’s Chorleywood (where new wine started), Holy Trinity Brompton (where Alpha started) and St. Michael le belfrey (where riding lights theatre group was founded). … Or Christians that have the ‘right’ rhetoric but behaviour is simply not loving and Christ-like, Ghandi said “I like your Christ, I don’t like you Christians” -Sadly as a Vicar and growing up in a Vicarage, I’ve seen people who have the right words but have been some of the most spiteful people I know… this should not be so after all “by this will all people know that you are my disciples that you love one another”. …Or rather than pray would rather do jigsaw puzzles, rather attack people doing mission than get off the sofa and help, won’t stop and acknowledge as a human being the busker, begger or big issue seller when they head off to buy their daily mail (just a thought, should Christians read the daily mail, I think not, but that might just be me!) “…by your fruits you will know them”. “The Greatest Cause of Atheism in this country, is Christians who confess Christ with their lips but deny him with their lifestyles, that is what an unbelieving world finds unbelievable” DC Talk. 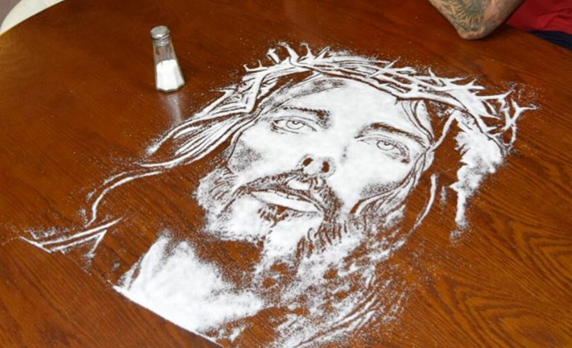 So a challenge today, let’s be ‘salt and light’, in other words, living it out in such a way that people notice the difference, be salty in such a way that people around become thirsty for the Christ in us the hope of glory. Bright and shiny lives that radiate Christ, was speaking to a lady yesterday who is unwell, and I was thinking she is someone who whenever I drop her off, she always leaves me smiling as she’s such a ‘Christ-like person’. “What if I stumble, what if I fall, will the love continue when the walk becomes a crawl?” (DC Talk). The great news of the gospel is that Christ not only forgives us our past, -and his mercies are new every morning- but fills us with his Spirit, the same Holy Spirit that raised Jesus from the dead, to live for him. My prayer is that when we meet Christ face to face we are greeted with the words well done good and faithful servant.